(Lincoln City, Oregon) – Like superheroes, even towns have their origin stories. 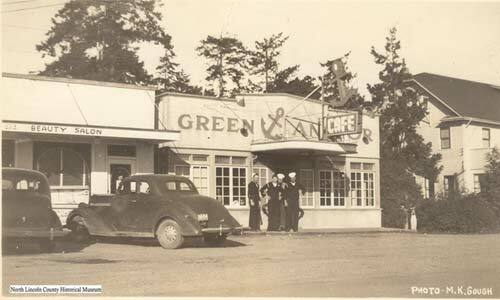 (Above: photo courtesy North Lincoln County Historical Museum, showing pre-Lincoln City in the '40s)). Lincoln City, on the central Oregon coast, has quite the history of how it was formed – and quite the fight over what eventually became its name. 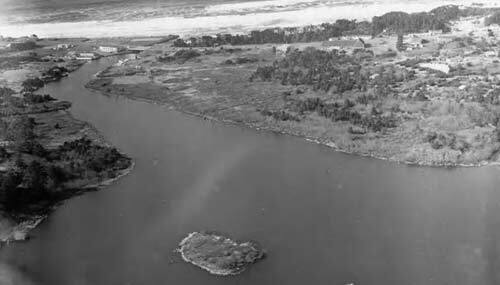 Currently, the town is about seven miles long and about a mile and a half wide, from shoreline to eastern boundary. It’s a tourism hotspot that’s essentially been that way for decades, although it had a somewhat sputtering start. North Lincoln County Historical Museum in Lincoln City managed to rustle up a bundle of documents on the subject, and it’s a fascinating trip that has to be taken in two parts. Part one is this article on the bumpy beginnings of Lincoln City, while the second part covers the naming of the town and the strange path that tale takes. Naming Lincoln City was a Wobbly, Wacky Process: Oregon Coast History. What most people don’t know is that the town is of a fairly recent origin: it came about in 1964. It’s also comprised of a bunch of little communities that merged together as one – under some duress. The very first communities in this area sprouted up from between 1896 to 1935, which included the villages of Kernville (to the immediate southeast), Cutler City, Taft, Oceanlake and Nelscott, along with the short-lived Wecoma Beach. They were considered started when their official post office came into being. They weren’t officially incorporated, however. This first happened with Oceanlake in 1945, and then Taft and Delake in 1949. Wecoma Beach never got that chance. 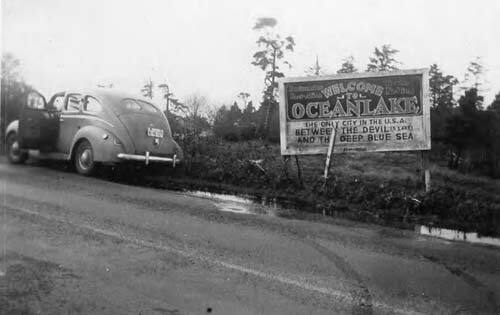 A series of annexation attempts by Oceanlake finally made Wecoma part of that little town in 1955, but not before three different elections, one court case where the absorption was actually thrown out, and a long, bitter struggle by both sides. By that time, the animosity generated by the annexation along with some sketchy bookkeeping practices in the area caused locals to begin to consider consolidating all five little burghs: Cutler, Taft, Oceanlake, Delake and Nelscott. Historians sometimes talk about seven little communities banding together, probably referring to Neotsu and the already-absorbed Wecoma. The idea was that auditing of city government money could be better done under one flag, so to speak, and there were the issues of obtainig a more efficient local government, better streets and mail service. Improved police and fire protection, along with hospitals, were also on the minds of locals. Interestingly enough, while most historians note the main elections on consolidation and even the name of the five conjoined towns happened in 1964, according to Oregon Coast History Center’s Steve Wyatt (in Newport), there was an election actually held about 1949 or so. The idea was first brought up in 1948, according to Wyatt’s research, at a Legion Hall in Taft. Even then, the small think-tank on the issue decided Lincoln City would be the best name for the new town. But editor of the North Lincoln County News, Jerry Stitter, immediately railed against the moniker. He published an editorial on December 6, 1948, that was highly critical: a foreshadowing of what was to come. More on the name later. The very first vote on the subject came about '49. Wyatt, in a 2000 article written for a Newport publication, said the vote came four months after that legion hall meeting. With everyone in those communities voting, they “turned down the proposed consolidation by 374 votes, a margin of 2.5 to 1,” Wyatt wrote. This concept came up again and was once more not well received by some, and it too began another drawn-out battle. Yet the margins narrowed considerably. The first vote in May of 1964 failed because of only seven no votes by residents of Taft. On December 8 of 1964 the votes finally came through: all five would become a single town. This time, Taft carried the measure by three votes. Soon after the election, a charter form of government was created with councilmen from each of the five burghs, plus a sixth councilman-at-large - and they even elected a mayor. This all took place on March 5, 1965, with Ross Meyer becoming the first mayor. He served until 1971, according to a 1998 article by Gail Kimberling of The News Guard. She interviewed Meyer’s successor, J.B. “Bud” Kiefer, at the end of the century. Kiefer is quoted as saying: “I was dumb enough to accept, but smart enough to know what to do with the position.” Through his time in office, the little Oregon coast town made a ton of civic improvements, fighting what he called the “no growth policies” at the time. Kiefer had to deal with much in the beginning, such as a warning from the state Attorney General that Lincoln City had not had a financial audit in five years, and the discovery he couldn’t call out of his city hall because there weren’t enough phone lines.